Fretting fatigue experiments were conducted on 7075-T6 and 2024-T3 Aluminum alloy specimens. The primary objective of this study was to quantitatively characterize fretting damages that resulted on the fatigue specimens. Fretting fatigue experiments were performed in laboratory air at various maximum fatigue stress levels at a constant normal pressure. From the confocal microscopy analysis of fretting damages, it was observed that fretting-generated multiple cracks on the faying surface could be responsible for the fracture of 7075-T6 aluminum alloy specimens (see Fig. 2) where as the fracture of 2024-T3 aluminum alloy specimen could be attributed to fretting-generated multiple pits on the faying surface (see Fig. 3). From the results, it is proposed that fretting nucleates damages of different nature depending on the material microstructure as well as its composition and the methods to alleviate fretting should consider issues pertaining to a specific material. Figure 2 -- Digitized confocal images showing the stages in the nucleation and the development of fretting damages on the faying surface of 7075-T6 Aluminum alloy specimen, Stage I Formation of debris - after 44100 cycles; Stage II Removal of material - after 96200 cycles; Stage III Nucleation of cracks - after 128400 cycles; s max = 172 MPa (25 ksi), s n = 13.8 MPa (2 ksi), R = 0.1, f=10 Hz, Lab air. 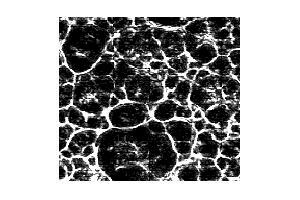 Figure 3 --Digitized image showing fretting nucleated multiple pits on the faying surface of 2024-T3 aluminum alloy specimen (analyzed after fracture, 81,100 cycles). In addition, fretting damages were quantified in terms of material removal by characterizing the depth as well as the geometry of fretting-generated pits on the faying surface of the specimen. Pit size in terms of pit depth (Pd), pit area (PA), and pit dimension perpendicular (PDy) as well as parallel (PDx) to the applied load also were quantified. 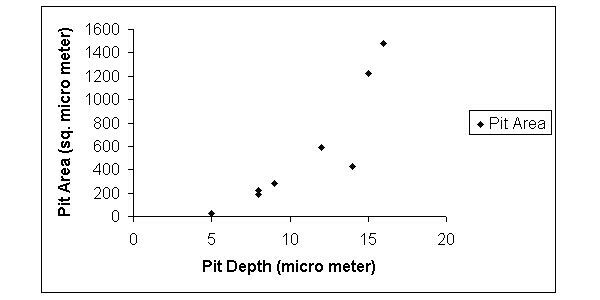 The quantified fretting-nucleated pits revealed a fair correlation between the pit depth and the area of the pits (see Fig. 4). Figure 4. -- Correlation between pit depth and pit area, Material: 2024-T3 aluminum alloy, Normal stress = 13.8 MPa (2 ksi), Max. fatigue stress = 207 MPa (30 ksi), Environment: Lab air.